La Vie en Rose: Some say a rosé shouldn’t be to be too pink, but we beg to differ. Our rosé is pale pink in color that exudes floral orange blossom aromas. Made from 100% Grenache from the South of France, we use mature berries to balance the flavors of ripe berries that gives it a wonderful acidity and soft minerality. La Vie en Rose: Some say a rosé should have a traditional label and a classic French name. We beg to differ. Notorious Pink’s label is classically elegant but the name is something else entirely. Las Vie en Rose: Some say a rosé should be very, very dry. We beg to differ. Our’s is not as dry as most French rosé, which makes it fabulously tasteful enjoyed with or without food. Perfect anytime you want it. Notorious Pink is a special cuvee made from Grenache, the leading grape varietal at Domaine la Colombette in the South of France. Rosé has often been considered a summer wine but it our goal to bring rosé to the forefront of everyday indulgence. 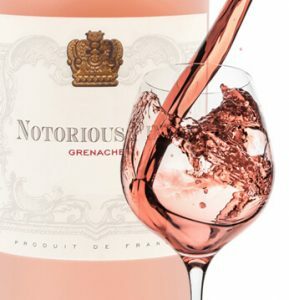 Notorious Pink has won Double Gold Medal Top Fifty Rosé 2015, five Gold Medals and two “Judges favorite,” in addition to a myriad of silver and bronze medals in regional competitions, as well as in Paris. At Domaine la Colombette, the techniques used have been tried and tested. The grapes from the oldest vines are bled, while those from younger vines are pressed. After settling, the musts are fermented at low temperatures (14-18c).